So it's been a whole school year since I last wrote about my first year in my homeschooling journey. You can read it here. SOOOOO... a lot has changed. Yes. A LOT. And it was mostly me. All things were going well. Classical music during school days, co-ops with friends, field trips, drop off program once a week where I had 6 HOURS TO MYSELF (Hallelujah!). But things were changing. I had a daily checklist of the agenda I wanted to complete for our school day. It was rigorous. It was fun. It was awesome. I didn't know it at the time, but I was slowly dying inside because I started to cut out the MOST important thing. You see, every morning my kids wake up and do their daily reading and journaling from their Jesus Calling devotional on their own. Then we would begin our school day with a bible time together, sharing and learning together. Well, as the school year went on, my agenda for their school day grew and I decided to push out our bible time together since they were already doing it on their own. Thus began the decline in our school year. It was like I was dying a slow death... trying to hold things together all on my own, trying to make sure that I was giving my kids EVERYTHING they needed socially, emotionally, and physically. My days were consumed with making sure that my kids had every possible opportunity to grow in every area. The problem was that I forgot to include the One who causes the true growth. The end of February hit and I felt weird. Almost depressed. I cried a lot and slept a lot. One day Greg came home to me crouching down in the corner of our kitchen floor crying. He told me gently that he thought I needed to see someone for this since he also noticed the changes in my behavior. I agreed but didn't know who to talk to. My oldest son, Isaac (10 yrs old), who is good at everything he does (and SUPER competitive), was upset one night because his younger brother, Joshua (8 yrs old), was better at juggling a soccer ball than he was. Not a big deal normally, but this night was odd. My oldest FREAKED OUT! He went into our backyard for 2 straight hours practicing to be better than his brother...crying... falling down... tearing up our grass, throwing, kicking.... yelling and angry. Like ANGRY! To be honest, I was tired. I had been dealing with so many emotions from him lately that I was just DONE. Around 10pm, I had him come in and go to sleep. I knew that our next school day would be interesting and emotional for him and I just could not do one.more.day of this. Desperate to talk someone who understood me, I ended up calling a lady that my hubby had introduced me to months before. She is a homeschooling mama of 3 and her kids are in high school. She is a couple steps ahead of me in this parenting/homeschooling journey and I needed some wisdom and guidance. We met and I cried for five straight hours. Her words cut deep into my heart. I realized that I got homeschooling all wrong. I realized that my priorities were upside down. Achievement and academics took the #1 spot in my day and there was no slowing down to deal with my kids' heartaches, their concerns, frustrations, etc. I just saw those as speed bumps that slowed down our day. Remember Isaac's freak out session? I wondered why he acted like that.... then I realized that he was me. For me, growing up Chinese meant that grades and achievements were EVERYTHING. I soon learned the game that you were bragged about and "honored" when you did well in school and had a great job title. Later on in life when I got serious about school, I became obsessed with getting good grades. I remember rewriting papers in my graduate program just to change a 98% to a 100%. My professors thought I was crazy, but I wanted/needed that A+... and I got it. I ended up graduating with my Master's Degree with the highest honors...A+ in every class. Was I happier? No. But boy, did I feel important and smart. Looking back now, I can see how ridiculous it was to think that my grades defined me. This unhealthy thought bled into how I raised my firstborn..to be the best, to get 100% on his school work. He learned from ME to find his worth through his achievements and accolades. He felt good about himself when he won, was the best, or was better than_______. I always saw his tenacity and determination as something that was positive. And it can be. But for my Isaac, it wasn't because the root of it was not healthy. His self worth was so tied into what he did vs. who God created him to be. How can you blame him when this is what he saw and was taught by his mother? Homeschooling is a magnifying glass of who YOU truly are. It reveals all your faults and every insecurity that you have. Then it magnifies it in your children for you to see just how much you need to Jesus. Praise God for His grace that stands in the gap for all our shortcomings! As I sat there in tears in front of my friend, I learned that homeschooling is not really about academics, but all about teaching character and how to live a life that brings God glory. SO many homeschooling mamas told me to focus on character and the academics will follow. As a Chinese girl, that was hard for me to grasp. What?? Not making academics the #1 priority??!!! How are my kids going to be able to get into a good college and get a good job? It shall come about, if you listen obediently to my commandments which I am commanding you today, to love the Lord your God and to serve Him with all your heart and all your soul, that He will give the rain for your land in its season, the early and late rain, that you may gather in your grain and your new wine and your oil. He will give grass in your fields for your cattle, and you will eat and be satisfied. If I teach my kids character and how to love God and love others, HE will take care of the rest. Does this mean that we ditch our academics? No. But it does mean that if we are in the middle of math and if one of my kids is dealing with frustration and a bad attitude, we address it instead of quickly sweeping it under the rug so that we can finish our checklist for the day. We take the time to guide them through it and we pray together. My kids know that they are more important to me than finishing that math lesson. After talking to my sweet friend and mentor, I went home and made some changes to our homeschooling day. I cried out to God to help me change my kids' heart and He answered, "Ok. But YOU first." You see, in order for me to show my kids how to live for God and where to get your self worth from, it has to come from their mom. I had to undergo heart surgery and allow God to recreate ME in the way that He designed me to be (not the way that I was brought up or the way the world told me to be) so that I can be an example for my kids. It wasn't/isn't easy and every morning I find myself on my knees praying for our day. I mess up and so do my kids, but we are all still learning this new way of schooling. Because really, God does not need another smart person, or doctor, or scientist. But He is looking to support a heart that is fully committed to Him. That is what He wants. - We start our school day studying the bible together again. 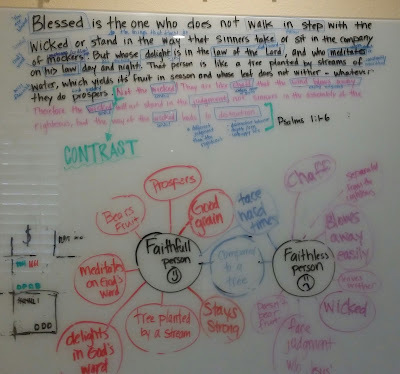 We share, highlight, and dissect words and meanings of verses. I'm finding out that we can use so many comprehension skills that I've used in my classroom by using God's word. - We pray that God would set the agenda for the day. I have a plan written out, but I allow God to tweak and change it WITHOUT stressing out that we didn't get everything done. - Although we focus on character, we do things with excellence because God deserves our excellence in ALL that we do. - They know that I consider our math time successful if they do 5 problems with the right attitude vs. 50 problems with a bad attitude. (Thanks to my mentor friend who gave me this advice). - We address frustrations and sadness instead of plowing through our agenda. If we need to revisit their feelings later, we do that, too. - If teachable moments come up in conversation, we take those moments to pause and talk about them. I've seen so many changes in all of us so far, especially me. Are all our problems gone? Never. But I find that I am not as stressed about our academics and that I have a beautiful peace that God will work it all out for us if we are chasing hard after Him. We are at the end of our school year and after about 3 months of schooling this way, our days are MORE peaceful. Perfect? No. But peaceful. I've seen my kids grow in amazing ways, submitting to what God wants for their lives, working through character issues, praying more, EXCITED about sharing God's word during our bible time (we've gone many times for over an hour before I stop them), and just seeing the bigger picture in life. We have slowed down, putting God's word first in our day and somehow STILL managed to finish our math books early. How is this possible?? Only with God! We still have ways to go, but we are finally on the right track. God is continuing to work on my heart everyday, teaching me new things about Himself and how he wants me to raise the kids that He has entrusted to me. This was such a wonderful post, Angela!! Thank you for sharing your journey! How lucky your kids are to have you as their mama! I agree; don't you hate how He wants us to focus on changing ourselves first?! 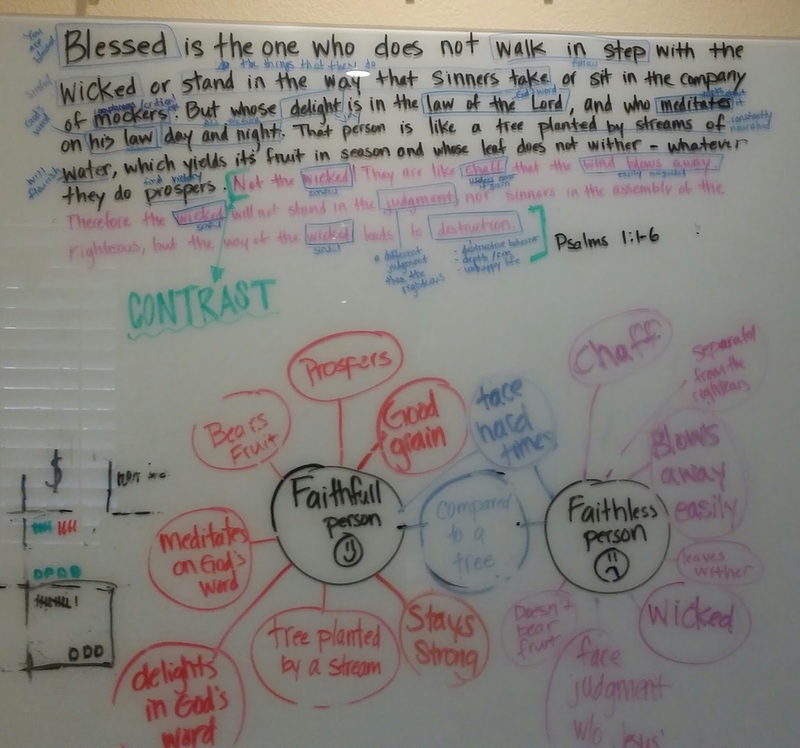 I love how you used scripture for close reading :) I'm sharing with my homeschooling friends! Thank you so much Kathie. Yes, it would just be SO much easier if others would change first. Haha. What a great post! Although I do not homeschool we have actually been talking about this at my church - Putting God first. My preacher just said the other day if we stop trying to do things our way and let him guide us in every aspect of our life, we would be surprised at the peace that could come over us. It is hard as it is human nature to want to try and control everything, but the one that is truly in control is our creator. Thanks for sharing!